You guys. You guys have NO IDEA how long we’ve been sitting on this stupidity while we waited to get around to Raji’s costume reveal. 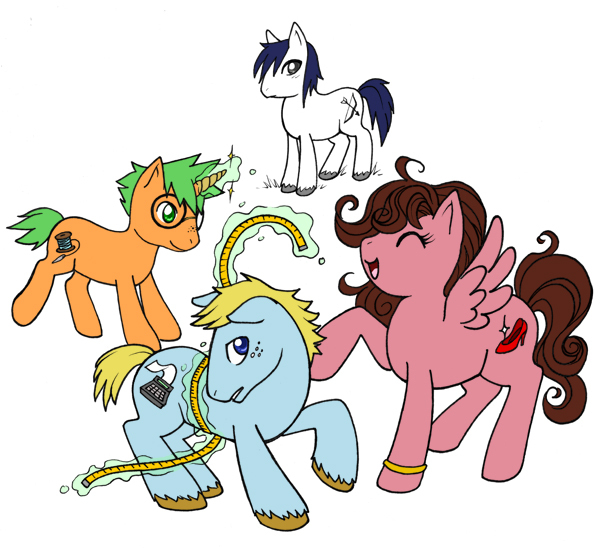 As though Mike’s life weren’t hard enough, we had to go and turn him into a My Little Pony. It’s really the next logical step if you think about it. And yeah, we watch My Little Ponies. We were probably watching My Little Ponies when your mom was in high school! WE’RE NOT ASHAMED. In case you’re wondering about Mike’s cutie mark (YEAH WE KNOW WHAT IT’S CALLED. NO SHAME.) it’s a calculator. He wants to be an accountant after all. Don’t think too hard about a pony using a bow and arrow or wearing human ladyshoes. And obviously their cutie marks turn in to their spirit’s symbol when they ‘transform’. WE HAVEN’T THOUGHT TOO HARD ABOUT THIS, SHUT UP. Tomorrow is the first day of Kawaii Kon! We’ve been out in Honolulu since Tuesday and we’ll be here for a while after the con spending some time with JP’s parents and getting some much needed outside-time so sorry for the bit of hiatus. 🙁 JP is going to TRY to get a page done this weekend during the con so with any luck we’ll at least have something to post while we’re out here. Follow us on Twitter if you want to get occasional stupid vacation photos. I can't wait for seeing him… fusioned? I squeed when I clicked next and saw this. I’m obsessed with the Ponies. Way to go ya’ll <3 Friendship is magic! The bronies shall inherit the Earth! Oh these are super cute! I want them all as pushies! -grabby hands- My mother threw out My pony collection years ago! I want these <3 They are the cutest ever. That. Is. Just. Pure. Epic! I want a Yuki plushie. And then I will hug it forever. WITH NO SHAME. SHAME NOT NEEDED. THESE ARE EPIC. This is hilarious. The My Little Magical Boy Ponies should make a guest appearance on the MLP cartoon. I hope you do make plushies of them. They’d undoubtedly look much more like the actual characters than the plastic versions of the “Friendship Is Magic” ponies, most of whom appear to have been run through some sort of blanderizing equine Barbie-ization machine and had their manes and tails straightened. OMG! Raji’s pony so reminds me of Rarity in the newest My Little Ponies! Lol~ I just finished going through all your comic pages and my head exploded from the last one… but anyway…. That is SO FINE. Are you going to be at Anime Next? I totes can’t remember, but it’ll be AMAZING to see you again! :3 I wanna make treats, so I wanna know which of my peeps are gonna be there! Also, I’m twinkypinkie on twitter, by the way. ^_^ I do wanna keep in touch, after all! 😀 I’m gonna watch you guys on Tumblr too! 😀 yay! My boyfriend just showed MLP to me, and I liked it. … I’m still not talking to him. I’m not going to lie, as soon as I saw this, I screamed. Friendship is magic, bro. Best. Show. Ever. You guys produce a comic about MAGICAL BOYS, and you think we’d judge you for being bronies? ?